DC Comics has made use of (various) sliding timelines over the years, all of them centrally based on their biggest character, Superman. Though their original reason for using the concept probably goes back to Superboy. As those of us of a certain age might recall, Superboy (between the mid-1940s to the mid-1980s) was “the adventures of Superman when he was a boy” (as the tagline for his comic went), his superheroic identity when growing up in Smallville. (Not the modern version, Kon-El, who’s a clone of Superman, though the two versions have met at least twice.) As such, his adventures took place in the relative past of Superman. But how long ago that “past” was has varied over the decades. As described in the Silver Age comics, Clark first became Superboy at age 8, though most stories focused on his high school years as a teenager. Superboy became Superman sometime in his junior year of college (age 20 or 21), after which point the other heroes associated with the adult Superman’s life—Batman, Robin, Green Lantern, the Flash, and the rest of the JLA—made their debuts. Aside from the young Aquaman (as “Aquaboy”), there generally weren’t any other costumed superpowered superheroes during Superboy’s time-era. (Whether the Earth-1 Wonder Woman debuted during Superman’s early adulthood or during his Superboy years is debatable, given Donna “Wonder Girl” Troy was rescued by Wonder Woman from a fire as a young child, per Donna’s original origin story…). Superman’s age was usually given in 1970s and 80s comics (up through the early 90s’ “Death of Superman” story) as being 29 years old (with Batman apparently of similar age). 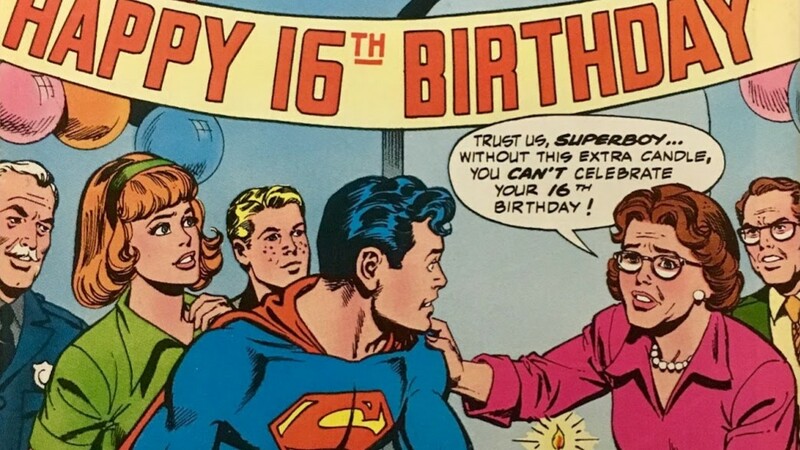 Starting with the “Death of Superman” story (and affirmed in the Zero Hour storyline), Supes’ (and Bats’) age was bumped up to 35 years old, and has stayed there through the comics today. When Superboy first appeared in 1945’s “More Fun Comics” #101, the writers apparently weren’t sure how to handle his setting (or just didn’t think about such things), and treated his era as being in some vaguely-defined point in the past. “Superboy” #149 (July 1968). Art by Neal Adams. With the late 50s and the start of the Silver Age, the writers (or more likely Superman editor Mort Weisinger) declared Superboy to have taken place in the early-to-mid 1930s, before Superman’s 1938 comics debut. Besides Weisinger, this was also probably influenced by the debut in Superman comics of letter columns, where readers noted Superboy’s time-era shouldn’t have had television or other then-modern stuff. The resulting Superboy stories used a lot of Depression-era artifacts. The Kents had an ice box, cars were Ford Model As, Smallville had a radio (but not a television) station, and so forth. Which was fine for awhile… until the late 1960s, when some noted Superboy still taking place in the 30s made Superman (and Lois, Jimmy, Batman, etc.) seem a great deal older than they should be. The late 60s run also started putting increasing emphasis on Superboy’s Depression-era setting, such as in “Superboy” #149 from 1968. “Superboy” #195 (June 1973). Art by Nick Cardy. Thus, starting with “Superboy” #170 in December 1970 (and explained in “Superboy” #171 in January 1971), Superboy’s era was officially moved to the mid-1950s, with a promise to keep Superboy on a sliding-scale timeline of about 13-15 years behind the present-day, 29-year-old Superman as the years rolled on. Superboy’s era was left as being in the 50s a lot longer than it should’ve. 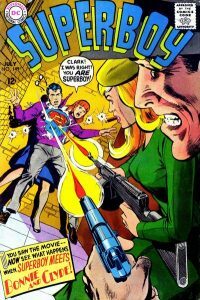 Possible reasons might’ve included: a simple mistake; Superboy’s non-Legion of Super-Heroes appearances getting fewer in the 70s (the Legion took over his comic in 1973, with solo Superboy stories relegated to occasional specials and a short-lived late 70s “Adventure Comics” run for the rest of the decade); the 1970s nostalgia craze for the 1950s (“Happy Days,” “American Graffiti,” etc. ); or the first Superman movie’s flashback to young Clark’s (Superboy-less) 50s childhood. 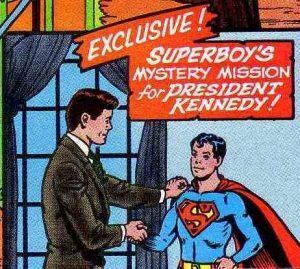 The “Adventure” run even had as a caption at the start of each story describing Superboy’s era as being in the “Fabulous Fifties,” with Eisenhower and “I Love Lucy” mentioned. “New Adventures of Superboy” #3 (March 1980). Art by Kurt Scahffenberger. 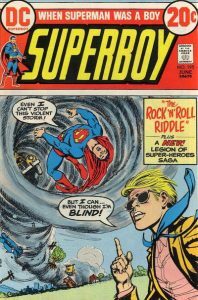 With the debut of a new solo Superboy comic in 1980, Superboy’s era was officially moved up to the mid-to-late 60s, featuring a 16-year-old Superboy that was explicitly shown as living 13-15 years behind whatever the present year was. The second issue’s editor’s page explained all of this, summarizing to date Superboy’s various time-era changes. 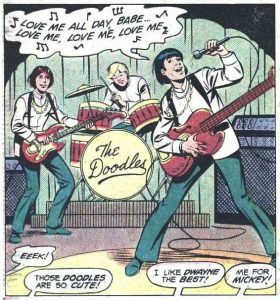 Thus, instead of seeing Lana Lang trying out her new hula hoop (as in the above-mentioned “Superboy” #195), Superboy stories began to present long-haired youths, and teenaged Clark as a Beatles fan. In one story, Lana urged Clark to consider modernizing his look a bit, mentioning “mod” clothes. Vietnam and moon shots also got mentioned, though oddly not the civil rights movement. (I would’ve liked to have seen the Boy of Steel meet Martin Luther King.) African-Americans had started appearing as mostly unnamed background characters since at least the late 60s/early 70s in Superboy stories. “New Adventures of Superboy” #53 (May 1984). Art by Kurt Schaffenberger. By the time “New Adventures of Superboy”‘s run ended in 1984, it looked like Smallville had finally entered the 1970s. 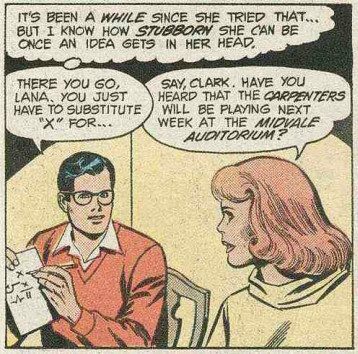 Lana asks Clark to go with her to see a Carpenters concert in “New Adventures of Superboy” #53 (May 1984). The Carpenters’ signature hit “We’ve Only Just Begun” debuted in August 1970, so the story’s probably set in 1971 (13 years behind the real world then-present day). The series’ late run also saw Smallville finally reflect some real-life changes in retail, as its businesses are concerned about the construction of a shopping mall. In real life, malls had started to grow in popularity in the 1960s and especially the 1970s. With 1985-86’s “Crisis on Infinite Earths,” and the subsequent Superman origin revamp by Byrne, Clark-as-Superboy was dropped from continuity. For awhile, the 2000s comics brought Clark’s Superboy career back, albeit only in Legion stories. However, with the New 52 reboot in 2011, it’s once again back to the post-Crisis Superboy-less status quo for Clark. Several Superboys have been introduced in the New 52 setting, though Jon Kent (the son of the pre-New 52 Lois Lane and Clark Kent) is the only one of current relevance. Despite these changes, Superman (and thus DC Comics as a whole) still used the sliding-timeline shtick post-Crisis. For instance, Pa Kent mentions Sputnik when Clark’s rocket first lands on Earth (Sputnik was launched in 1957, 29 years before 1986). Additionally, several late 80s stories presented Pa Kent as a veteran of World War II; by the 90s, this had been changed to Pa being a Korean War vet. While Ma and Pa Kent’s ages have never been set in stone (portrayals have ranged from late middle age to looking like contemporaries of Grandpa Simpson), I’d imagine these days (if he still served in the military at all), Pa Kent’s now a veteran of the Vietnam War, or even the first Gulf War. As of 2018, a 29-year-old Superman would’ve been eight years old in 1997, while being a 16-year-old in 2005 and starting off at the “Planet” as a 22-year-old out of college in 2011. If we go with a 35-year-old Superman, Clark would’ve been eight in 1991, 16 in 1999, and 22 in 2005. Music acts like Usher, Jay-Z, Matchbox Twenty, and Beyoncé. Dial-up and early broadband Internet. Dealing with the early days of the War on Terror. Of note is that “Smallville” debuted in 2001, and featured in its first season a 14-year-old Clark Kent. Enough real world time’s passed that Clark would be 29 in 2016. The show’s first season shows Clark using a then-contemporary Mac. Finally, another blog also did a look at Superboy’s continuity changes over the decades, with even more detail than what I wrote above.